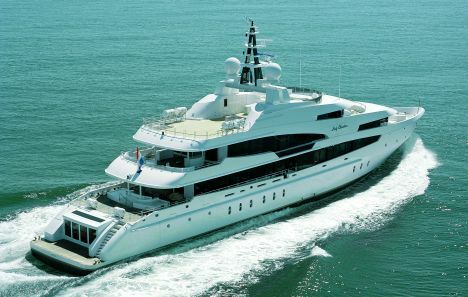 Launched on 30th April last year, Lady Christina comes with all the qualities which, since 1992, have won the Oceanco shipyard a valuable international reputation. Classification: 100 A1 -SSC - Yacht - Mono G6, LMC, UMS-MCA. 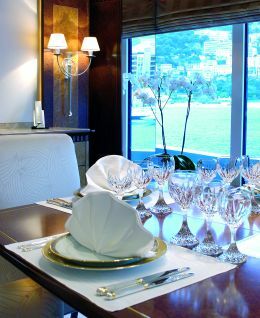 For further information contact Oceanco, Gildo Pastor Center - 7, rue du Gabian - MC 98000 Monaco; tel. 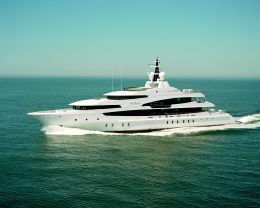 +377 93100281; +377 92056599; oceanco@oceanco.mc. As with all the other vessels built at the yard, work began on Lady Christina as a result of close contact between designers and future owners. This relationship produced the guidelines, in which there is an outstanding matching of modern solutions with traditionally inclined stylistic choices. The result is a yacht abreast of the times but capable of maintaining aesthetic topicality over the years. The yacht is designed on four decks - the marine architecture handled by the yard's internal team - while the interiors were done by Francois Zuretti Design which created particularly elegant spaces in a modern style but with materials and colours that make them warm and welcoming. Let's now proceed to analysis of Lady Christina's four decks, starting with the lower which features certain special details such as a gym in the stern area with plenty of space and with four large windows giving onto the sea. Going forward there's a big garage for the tender on the starboard side, two jet-skis in the centre and another similar tender on the port side, both of which can be launched by way of an opening in the hull. On the same deck, proceeding forward, there are two guest cabins with twin beds and private bathrooms, plus another two with double beds in the amidships area, also with private bathrooms. 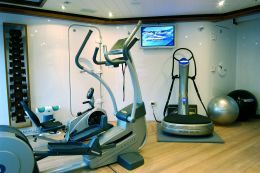 Slightly forward of the amidships zone there is a spacious technical area stretching the whole width of the beam, accessible from the crew's quarters which occupy the whole forward section and include cabins, mess and entertainment areas. On the main deck the aft zone is for open air relaxation. There are spacious areas partially protected by the extension of the deck above, with accessories that ensure the right comfort for informal convivial moments. 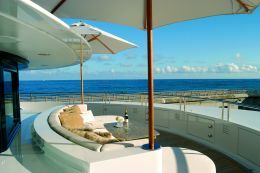 Further, from this area you directly access the large aft sundeck and the main saloon. The main deck is almost entirely designed for indoor daytime activities with small saloons, dining room, galley, office, a multimedia entertainment room and the captain's cabin with double bed, private bathroom and direct access to the bridge. 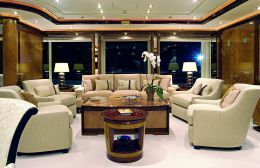 The bridge zone occupies the forward part of this deck and includes a spacious chart area, an office corner, a separate technical room, a relaxation corner with L- shaped sofa and table and, in a central position, a generously sized command bridge. 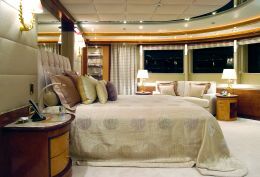 Let's take a look now at the upper deck, mostly occupied by the owner's suite, especially in the forward area: a central double bed and the large windows of the superstructure surrounding it over more than 180°. The spaciousness means that it can have a large dressing table area, an office corner, a relaxation area with table and a spacious bathroom with beauty salon including a big Jacuzzi. There is also a wardrobe cabin and a toilette. 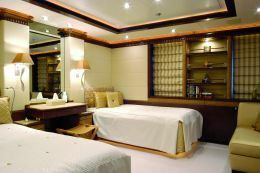 In a word, a suite where even the most demanding cruise can be enjoyed in full comfort. 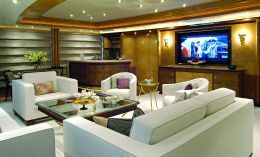 Aft of the amidships zone this deck has other spaces for on-board relaxation: card tables and sofas, bars and multimedia systems and access to the external area aft where the furnishings are completed by a large dining table and semicircular sofas. The second upper deck is wholly dedicated to outdoor activities, especially sunbathing: sun-beds, sofas, bar, open air cooking facilities and an area forward which is completely surrounded by seating that converges in a spacious sundeck, protected by a runner in steel and glass. The research that lead designers and owner to development of this project was certainly not easy. The owner raised many problems requiring suitable solutions by designers and architects. The building materials considered most appropriate for this vessel of no less than 62 metres were steel for the hull and aluminium for the superstructures, a choice which meant that distribution of masses could be suitably managed even though the interiors are furnished with heavy materials like marble or the glass of the large perimeter windows. Since it is a displacement hull, the power required of the engines is not excessive, and in fact with two 1.800 HP Caterpillars Lady Christina has a cruising speed of 12 knots and a maximum of 15, with a range of no less than 4.500 miles. Undoubtedly a yacht ready for all kinds of cruising, be it in the Mediterranean, like the owner's first cruise, or transoceanic, which is what this yacht was built for.